The Kampsville Ferrry crossing on the Illinois River. A little piece of water transportation history is alive, well and operating in many towns and cities across America. Included is the small village of Kampsville, Illinois, on the Great River Road, Highway IL-100. Ferry boats can carry passengers, their vehicles, and cargo across waterways everyday, but unless we live near a ferry boat, we hear little of this quiet mode of transportation. At least 18 States offer some kind of ferry service even though some ferry boats do not haul vehicles or cargo. The best known ferry boat in the United States is probably the Staten Island Ferry which carries more than 65,000 passengers daily. This ferry route has a long history going back to the 1700s when boats began ferrying travelers between Staten Island and New York City. Scottsville, Virginia, is home to the Hatton Ferry, one of the last two remaining "poled" ferry boats on the James River. The Mississippi River is well known for its steamboats and barges as well as ferry boats. Early water transportation was little more than a flat-bed raft that could transport travelers, covered wagons, and livestock across rivers. When the railroads came and bridges were built most ferries were no longer needed. But in Calhoun County, western Illinois-where industrialization is almost non-existent, the terrain is rugged, and the population small-this 37-mile long peninsula with access to steamboat landings knows that water travel is still the way to go. The Kampsville River Ferry transports passengers and their vehicles across the Illinois River 24 hours per day, everyday for no fee, unless the river is frozen or the water is unusually high. 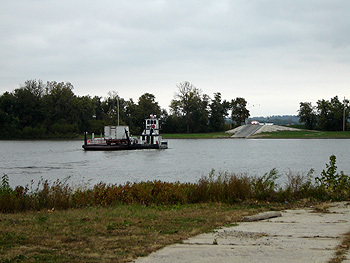 The boat, operated by the Illinois Department of Transportation, connects IL-108 from the western bank (Calhoun County) to the eastern bank (Greene County) of the river. The Kampsville Ferry is one of two Illinois Department of Transportation river ferries. The other is 25 miles further south at Grafton, Illinois. Grafton, a city with a population under 700, is in Jersey County located at the confluence of the Illinois and Mississippi Rivers. Serving in a transportation capacity is not the only function of the Illinois River. It is home to migrating waterfowl and other wetland wildlife as well as forest creature preserved by The Illinois River Road Scenic Byway program. Kampsville, with a population under 400, is home to the Center for American Archeology (CAA). The CAA studies the rich historic culture of the area and the transportation role of the river in early civilization and wildlife. Since the last Ice Age, humans have lived along the banks of the river and today homes on stilts dot the river bank, as well as an occasional pontoon, row boat, or motor boat. But for travelers wanting to take their vehicles, the Kampsville River Ferry is the fastest way to cross the Illinois River.